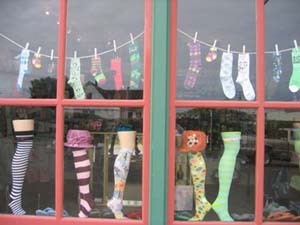 Katie's Whimsical Shop Lots of Fun Choices "Socks Under Glass"
You will enjoy a visit to Pippi's Longstockings which is a fun whimsical casual wear botique to shop in. Every color and style of socks, striped, dotted & plaid; baby to adult; cushy, soft & feel-good to wear; plus gloves, hats, handbags and sunglasses for the beach is stocked here. 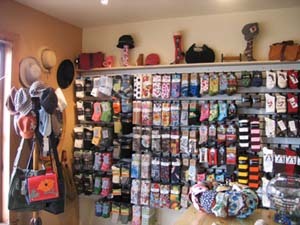 The cheery and colorful inventory is divided into Women's Socks, Men's Socks, Women's Tights, Kids, Toe Socks, Arm & Leg Warmers, Pippi's Picks, Long Socks, Wool Socks, Biella Socks, Celeste Stein Socks, David & Goliath Socks, E.G. Smith Socks, Foot Trafic Socks, Hue Socks, Habitat Socks, K-Bell Socks, Laurel Burch Socks, Little Miss Matched Socks, Life is Good Socks, Loungefly Socks, Ozone Socks, Nouvella Socks, Sox Trot Socks, SmartWool Socks, Toe Hugs Socks, Trumpette Socks and Wigwam Socks. Fun socks to wear include Ozone socks with great quality and unique colorful patterns. Ozone socks are another favorite of Pippi's! They are specially made in France and Turkey. There are the super cushie and comfortable SmartWool socks. In our expert opinion these are some of the best socks around. Once you start wearing SmartWool socks your feet won't want anythingelse! SmartWool is a machine washable non-itch wool, it will keep you nice and toasty in cool weather but cool in warm weather, while also wicking moister away from your feet when you are being active. For extra comfort check out the SmartWools with the cushion sole! For the little girl in you there are the Little Pippi in all of us, 3 single socks to a package so you have to mix and match them (sooo much fun!). Also if the sock monster gets one from the dryer you are still left with a pair! These are available in kids and adult sizes.